After coffee and continental was served to my guests...we hit the short roads (Soledad Cyn, Agua Dulce Cyn, Vasquez Cyn) up to Bouquet. Cyn, where in the first tight corner I nearly took out a few jogging Forestry dudes, all in line on the inside of a 10mph corner run-off that was about 12" wide....Wake-up call! I think one guy wet himself. Over Spunky to San Francisquito was fairly deserted. One nice old gal pulled over for us twice! 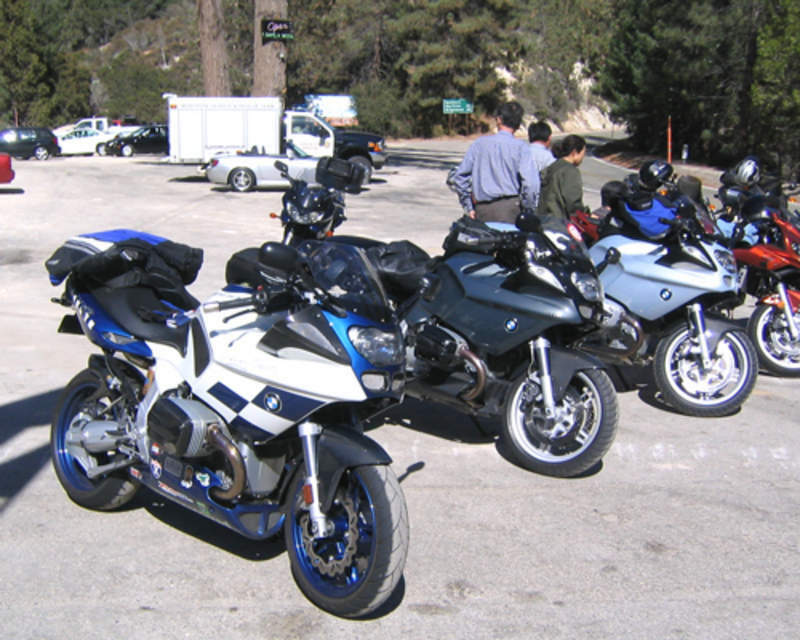 Then north on Angeles forest to Upper Big Tujunga (9 mile) and hit the bumpity Angeles Crest. $8 Burgers at Newcombs and MotoGP on the big screen was a perfect rest stop. Arbi showed up on his really cool Boxster, Prof Wacko was around somewhere. Beemers where represented pretty well yesterday I must say. We finished off the top of the crest and cut down Big Pines (I think I'm getting my rythm! ), a quick clip down Ft Tejon to Mt Emma and it was over...aw shucks. A perfect day, cool and sunny, like the last day of perfect riding weather, (but probably not). The B-bike gets the award for most accessories on an S...GPS, video, V2 radar, HARD, 3-4 flavors of carbon...what, no deer whistles...? A beatchin' BoxerCup, no two ways. what's the trick with these photos anyhow? Mak'em over 500 pixels? These are 500 wide...Brad? rapid~ it seems like if you chop the photos down to 400-450 wide, they settle in. see "Oh Dear!" post for my response to the deer whistle. my b-in-law lives in the WA woods. he says deer whistles only ensure that the deer looks at you...just before you hit it. other than that...useless. so I've "heard"...or is it "herd".. I hear ya Randy...Isn't Brad just a killer on the old ego! Looks like a very nice ride. Glad you all had fun, still looking for video (psst, Brad). There are those who ride, and those who want to ride. great write-up. that describes the day perfectly. Tell me why I live in Illinois?! Granted the weather here in Chicagoland has been fabulous for the last few weeks, why do I feel like I'm missing something!!! Damn!! You guys went right by my house. I need to check my email more often for these special offers from Rapid. Just shut the F*** up and ride/drive the thing. ya brad...and don't forget to add a good soundtrack like "Follow the Yellow Brick Road" sung by a bunch of Munchkins...or how about the Umpa Lumpa song from Willy Wonka. lol Rapid, I know that's more like what you were thinking. But, I'm sure brad will be more likely to be thinking in line with the stuff I mentioned...just call it a guess.